Copyright © 2007 by Timothy Conway, Ph.D. Copyright © 1990 by Timothy Conway, Ph.D. The religion of Buddhism, which flourishes in many of the countries on this earth, began with the illustrious life of that infinitely wise, gentle, loving sage, Siddhârtha Gautama. His deep inquiry into life, his breakthrough discoveries, his sublime wisdom as a teacher, and his exemplary life and conduct have all combined to create one of the great religions of the world. Siddhârtha Gautama, known as the Buddha or “enlightened one,” Bhâgava, “Lord,” and, later, Shâkyamuni, “the sage from the Shâkya clan,” was born circa 563 BCE in Lumbinî, northern India (now Nepal) to King Suddhodhana and Queen Mâyâdevî. Legend has it that Queen Maya had a premonition of the Buddha's coming to earth in the symbolic form of a great elephant. The legends also say that the Buddha was born out of Mâyâ's right side [symbolizing a more conscious birth by Siddhârtha, less hindered by delusion] in a garden at Lumbini while she was traveling, and that he thereupon took seven steps and proclaimed himself to be the world-honored one. Whatever the case this was a child of great splendour, a very special child.... The story goes that the demon Mâra killed Mâyâdevî seven days after his birth. As a boy, Siddhartha demonstrated great intelligence and rare talents, such as being the only one able to wield a certain mighty bow. At age 16 Siddhârtha married a woman known to tradition as Yashodharâ. She would later bear him a son, Râhula. The seer Asita had prophesied in Siddhârtha's own infancy that one day Siddhârtha would become the Enlightened One. Siddhârtha's father, trying to insure that his son would not leave the throne, attempted to keep young Siddhârtha from experiencing any suffering and any deep philosophical questioning. But it so happened that one day Siddhârtha did chance to see a sick man, a dying man, and a corpse­—as well as a sage meditating on the purpose of life. Sure enough, Siddhârtha began to deeply ponder and reflect upon what he had witnessed. "Why does man have to suffer? What is the real purpose of life? Is life only a matter of being born, falling sick, decaying and growing old, eventually to die and go into oblivion?" He thought about such things for a long time. Finally, at the age of 29, deeply moved by the mystery of human suffering, the young prince decided to renounce his comfortable family life with Yashodharâ and Râhula and take up the life of an impoverished mendicant in search of a way for all beings to transcend suffering and the painful cycle of birth and death. He studied meditation briefly but thoroughly under two prominent religious teachers of his day, but was dissatisfied with their teachings, which did not seem to bring ultimate freedom from all forms of suffering. He eventually wandered off and took up with a band of five ascetics, who lived in a jungle near Gaya, India. These ascetics were practicing severe austerities in hopes of dissolving karmic attachments to the body and breaking through to a discovery of eternal peace and happiness. But after he had lived six full years of this intensely austere life, Siddhârtha realized that he was only torturing and weakening his body. Therefore one day during his 35th year, he decided to discontinue this life of self-imposed torture. He broke a lengthy fast by eating some rice-milk offered to him by a local village woman. With the increased strength afforded by this meal, he sat down under a certain fig tree, the “Bodhi tree” at a place now famous as Bodh Gaya (in Bihar state, India). He resolved not to ever get up again until he had transcended all limitation and penetrated through to the highest, most liberated state of consciousness, complete enlightenment (Pali: nibbâna; Sanskrit: nirvâna). This supreme sacrifice and heroic resolve would bring a magnificent result. On that full moon night in May, Siddhârtha practiced a kind of vipassanâ, or "clear seeing" meditation; he psychically inspected all his former lifetimes for the lessons to be learned from these. Furthermore, he endured with great equanimity the terrifying onslaughts created by the demon Mâra. Mâra also tried to tempt Siddhârtha with sensual pleasures. At one point, it is said that Siddhârtha endured a tremendous deluge of rainfall created by Mâra, Siddhârtha was favored by Mucilinda, the king of cobras and serpents, who, along with the other serpents, spread their hoods and offered protection to the meditating sage. At last, when Siddhârtha was nearing complete enlightenment, Mâra challenged Siddhârtha about the truthfulness of his former incarnations as a bodhisattva who had helped sentient beings. Had Siddhârtha really been a great sage in past lifetimes? Siddhârtha pointed to the earth in the classic gesture (mudra) known as the bhûmisparsha mudra and the Earth herself gave witness to the fact that Siddhârtha had indeed lived many lifetimes as an entirely selfless being who had helped many other beings through his heroic actions. Artisans of many cultures have given us a wealth of images of this poignant moment when the spirit of the Earth rose up to meet the touch of Siddhârtha's hand and announce that he was indeed the great Buddha to come who had spent untold lifetimes in service to others. Mâra finally left. Siddhârtha meditated through the long, lonely night, stilling his mind, exploring the great expanse of pure consciousness. At last, with the dawn's breaking light, the great moment came: Siddhârtha realized his complete spiritual awakening into Buddhahood by giving up all selfish desire, including the deluded desire of taking oneself to be a separate self. He had clairvoyantly reviewed his countless past lives, and the karmas (actions done out of a self-sense) of beings throughout the universes. Now, he suddenly awakened by dissolving altogether the knot of egotism through profoundly penetrating wisdom and release of all clinging. Siddhârtha saw the three marks of worldly existence: first, he saw that all forms of experience are utterly fleeting and impermanent (anicca); secondly, he saw that no form of experience, high or low, is solid or real, all experiences are insubstantial, empty (anâtta, literally "without self"), and even the cognizer of experiences, the assumed separate self, is also not a solid, substantial entity; thirdly, Siddhartha saw that, because of this impermanence and insubstantiality, unenlightened worldly existence is ultimately quite dissatisfactory (dukkha), not at all capable of affording true and lasting happiness. Siddhârtha, now a Buddha, or "awake one," sat contentedly under the tree at Bodh Gaya for quite a number of days in this exquisitely peaceful blissful state of being. He had completely lost his ego-self in this nibbâna (Skt. : nirvâna)—which literally means "blowing out the fire," the fire of selfish greed, hatred and delusion, the delusion that one is a separate self, a "me" separate from "you" or separate from an "external world." So unattached was the Buddha that he had even renounced the desire to be a teacher of this profound wisdom which had dawned in his life. Moreover, he saw that it was far too subtle a teaching for sentient beings to understand, so lost and caught are they in the six realms of existence, their deluded ego-sense reincarnating as demons, heaven-dwellers, frustrated ghosts, animals, hell-dwellers, and humans. However, the Buddha's infinitely compassionate heart motivated him to begin contacting various sentient beings on these different levels, teaching them the way to real happiness. Eventually Siddhârtha, the Buddha Shâkyamuni (the sage from the Shâkya clan) got up and began to walk through the country and along the road the many miles to the city of Varanasi. At one point he met a spiritual aspirant who was greatly impressed by the Buddha's shining countenance. A remarkable change had come over Siddhârtha—he now shone with the light of absolute peace, total freedom from desires, fears, and selfish delusions. The Buddha came to Deer Park at Sârnâth (just north of Varanasi in north central India), and encountered his five ascetic companions of former days, overwhelming them with his enlightened radiance. Buddha then spoke to them and to the assembled celestial beings his first sermon, in which he enunciated the Middle Way between the imbalanced lifestyles of indulgence in pleasure on the one extreme and obsession with austerities on the other extreme. He also taught them what came to be known as the Four Noble Truths and the Noble Eightfold Path, which basically point out that selfish craving makes life utterly dissatisfactory, and that the way out of selfish craving is through cultivating pure-hearted virtue, insightful meditation, and enlightening wisdom. Upon hearing the words of the Buddha Shâkyamuni, the five ascetics became his disciples and followed after him. Soon after this, the Buddha rapidly converted to his sangha, or company of disciples, a rich young man, then three very popular spiritual teachers, and then an influential king, and with these conversions many thousands of people also quickly joined the Buddha's sangha, which came to include monks (bhikkhus/ bhikshus), nuns (bhikkhunîs/ bhikshunîs), novices (shrâmaneras), and lay followers (upâsakas). His wife Yashodharâ and son Râhula also joined the sangha. Over the years, Shâkyamuni drew a following of many more thousands of people from all walks of life. Other former family members, and even his avowed enemies came to join him and hear his liberating teachings. The famous courtesan Ambapali, after not being able to win over the Buddha with her charms, eventually became his disciple as well in her later years. Whatever their background, many people came to follow his way of virtue, meditation and wisdom. The Buddha spent the next 45 years traveling all over India, walking 15-20 miles a day, nine months a year, resting only for the three month monsoon period with large gatherings of disciples. He would meditate all morning (during which time he clairvoyantly observed the minds of sentient beings in the vicinity to ascertain who was ready for liberating teachings), then he went to collect food for his only meal of the day, and spent the remainder of the day meditating, ministering to the spiritual needs of his followers and any interested persons, inspiring them with his supernal peace, kindness, gentleness, and occasional miraculous powers, illuminating them with his transcendent yet simple wisdom, and challenging them to give up their selfishness. His preaching and counseling had a major impact. Many of his talks were memorized by disciples and later preserved in a voluminous collection of Pali-language scriptures now translated into many languages. And the image of the Buddha as supreme teacher is found all over Asia. The Buddha had once miraculously grown a mango tree for his follower Cunda [or Ganda]. One day in the year 483 BCE, when the Buddha was 80 years old, he accepted from Cunda, his well-meaning host, some inadvertently poisonous food (most likely some mushrooms); the Buddha would not allow his disciples to eat them, but consumed them himself so as not to offend his host. Soon after this, the Buddha fell ill. Then, a few days later, while traveling with his disciple Ânanda, he picked a spot to spend his last hours. He sat for a while, then finally he lay down, his earthly end rapidly approaching. Disciples, who had heard of his illness, gathered around him, deeply sorrowful that their beloved teacher was about to depart. They asked him for his final teachings. The Buddha instructed them on all the essential points of wisdom. His last words to his disciples were these: "All worldly experience is subject to decay; aspire to the great wisdom and work out your liberation with great diligence." With this final instruction, the Buddha went into silent meditation, examining all the realms of being and all the states of higher consciousness—the states of infinite space, infinite consciousness, nothingness, and neither perception nor non-perception. Then Siddhartha left behind the mortal body once and for all. He had now completely transcended the realms of selfhood and materiality and was merged in/as the Absolute Reality, the unborn, undying, unstructured, unlimited domain of pure bliss, the unfathomable peace of nibbâna. Siddhârtha's physical disappearance was a great sorrow for his less developed disciples, and a sublime teaching to his more mature disciples about the law of change and decay of all forms. These disciples spread the life-story and the teachings of the Buddha throughout India and abroad, where the Buddha-dharma, the way of complete awakening, has flourished for 2500 years. Siddhârtha Gautama the Buddha, this glorious light of Asia, still shines in the hearts of sincere aspirants today; he will always be remembered and cherished by people who value the way of supreme truth and goodness, for he displayed the exquisite wisdom and compassion which liberate all sentient beings. "I take refuge in the Buddha (principle of Awakening),... in the Dharma (teaching of liberation),... and in the Sangha community"
Note 1--The more ancient birthdate and death-date for the Buddha (563-483 BCE, or perhaps 566-486 BCE) has been recently upheld by scholars Alex Wayman, E. Bruce Brooks, A.K. Narain and others against the view advanced by Heinz Bechert et al. in the 1980s, which argues for the Buddha dying as late as the 350s BCE. One sage did more than anyone during the early shrâmana-era of ancient India to amplify the renunciate path beyond traditional Hindu concerns for ancestors, gods, Vedas, rituals and caste, and his motivation was pure, selfless compassion for all sentient beings. I speak of Siddhattha Gotama (Pâli; Skt. : Siddhârtha Gautama), venerated as the Buddha, Awake One, or Bhagavâ, Blessed One. All evidence points to Siddhattha as historically real (no mere legend), magnificent in his spiritual mastery and widely esteemed in his ministry. 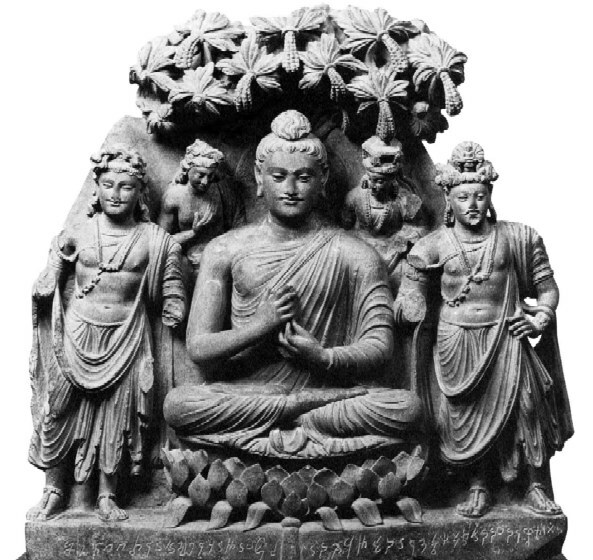 An exemplar of the highest freedom, and a wise counselor sharing exceedingly subtle psychological and spiritual truths, the Buddha also founded a large sangha or spiritual community for almsmen, almswomen and devout lay supporters—by which north Indian society and later all Asia were indelibly transformed. Frequent passages of the Pâli scriptural canon reveal the Buddha (to the chagrin of materialists and pseudo-skeptics then and now) routinely deploying paranormal powers of ESP and PK —for instance, scanning minds to discern people’s aptitudes and past lives. Widely revered as “the enlightened teacher of gods and men (satthâdevamanussâ), his ministry unfolded not just for humans but extended into subtle interdimensional realms. He taught celestial devas stuck in the heavens, demonic asuras mad with power, haunted and haunting “hungry ghost” petas, and hapless dwellers of the hellish purgatories that their states are temporary, changeable, caused by deluded clinging to a separative self-sense with its sundry attachments and aversions. The profoundly Supra-personal nature of this final spiritual realization—it is not personal, and certainly not “impersonal”—is strikingly expressed: “Nibbâna is, but there is no one in nibbâna.” Intelligent Awareness abides, but “boundless” and “without surface” (anidassanam)—not fixing onto anything internal or external; no limiting identifications whatsoever. As with realization of Brahman/Âtman, Nibbâna is not just beyond normal egocentrism but also beyond the heavens and any merely personal god. Thus they appear to be quite independent streams of spirituality. On another front, those who think the Buddha was an “atheist” do well to read those discourses in the Canon wherein he posits the limited nature of the highest intelligent personal being or god at the top of the kosmos, Brahmâ (actually, an office held by various sublime beings over great aeons of time), who is still subtly, benevolently attached to the world and to continued existence. The Buddha several times declares, “I know Brahmâ and the world of Brahmâ, and the way to Brahmâ’s world, and the path of practice whereby this Brahmâ world may be gained.” But he affirms that nibbâna is the unexcelled Reality beyond even Brahmâ and his heaven realm. In the 1980s, a controversy arose among western scholars as to when the Buddha lived, with one camp arguing for a later date. Yet sound arguments by the distinguished late Buddhologist Alex Wayman, and by E. Bruce Brooks and A.K. Narain persuasively support the traditional scholarly date that the Buddha expired either in 486 or 483 BCE. If, as tradition claims, Siddhattha lived to age 80, he would have been born back in 566/3 BCE. These dates are important, for they allow us to keep our older estimates for dating the major Upanishads and other key works and developments in ancient India. Archaeologists have good evidence favoring the traditional story that Siddhattha (“accomplishment of the goal”) was born in Lumbinî within territory belonging to the Sakya/Shâkya people in the Himâlayan foothills (present-day central Nepal near the Indian border). He was raised in the nearby town of Kapilavatthu in three palaces of his father, Suddhodhana, a descendant of the Gotama clan and a râja of a small kingdom of the Sakyas. The boy’s mother, Mâyâ, died a week after his birth; he was raised with love and affection by her sister, Pajâpatî Gotamî, another of the râja’s wives. Asita the seer prophesied to Râja Suddhodana that Siddhattha would grow up to become either a great world ruler or a spiritual savior. Preferring the former destiny for his son, the râja pampered Siddhattha in a sheltered environment filled with toys, entertainment, pleasures and beautiful women—in hopes of seducing him into a sensuous life of luxury. He didn’t want Siddhattha to be provoked by life’s hardships into leaving home and taking up with spiritual aspirants pondering the deeper meaning of existence. At age 16, Siddhattha, highly proficient in the mental and physical skills taught in his princely training, married a girl perhaps named Yasodharâ. By age 29, after years of easy living, he had grown quite uneasy, for he had seen sickness, old age and death in his limited forays beyond palace walls. He also glimpsed a mendicant in serene meditation. These experiences led him to consider deeply the plight of sentient beings and the possibility of a way beyond suffering. Thus did he resolve to leave home, take up the way of the shrâmana renunciates, and try to find a universal solution to our existential crisis. So one night he left the palace on his horse, helped by Channa the stableboy and by Yasodharâ, who saw her husband’s discontent and knew his holy aspiration to find relief for all beings. He cut off his hair and beard and switched garb with a hunter, donning a simple yellow robe, a robe he later gave up for ascetic rags and hairshirts. He learned from teachers Âlâra Kâlâma of Vesâlî: and Uddaka Râmaputta of Râjagaha methods for meditative trances leading up to an absorption in the spheres of nothingness and neither-perception-nor-non-perception. When he quickly mastered these states, his teachers honored him as an equal and invited him to help teach their disciples, but he knew that high meditative trance states (jhânas) don’t end the egoic rebirth-cycle. So he left these teachers to adopt a life of severe austerity: long terrible fasts on little or no food, eating feces, difficult standing and squatting postures, sometimes keeping altogether away from human company “like a wild animal,” even resting on skeletons in a charnel ground, lovingly enduring bad abuse from certain cowherders. At some point five ascetics joined Siddhattha, looking to him as their leader in self-mortification. The years rolled on. In his 35th year, realizing his practices had only put him on death’s doorstep, he began to eat a decent daily meal, whereupon the five ascetics left him. One momentous day, Siddhattha ate a tasty rice pudding dish brought by the village girl Sujâtâ. His energy renewed, he sat down under a ficus tree near Uruvelâ (in Bihar) and bravely resolved never to leave his seat until he had penetrated the cosmic dream and found authentic freedom from all manner of rebirth, high or low. Meditating through the night, Siddhattha, already adept at interdimensional knowing, recalled his past-lives and those of all beings in the cosmos. He equanimously withstood temptations and attacks from the archdemon Mâra, who, like many celestials, try to distract humans from awakening. As the tale unfolds, at the pre-dawn light of the morning star, Siddhattha confronted and dissolved the last vestige of the egoic “architect” of his illusory personal edifice and woke up from the aeons-long trance of separate selfhood into the beatific freedom of nibbâna. Fully, irreversibly enlightened, a Buddha—the latest in a long line extending back aeons, he would say —Sakyamuni, the Sakyan sage, remained for 49 days under the Bodhi tree (the site later famous as Bodh Gayâ). He was “inclined to inaction,” eating again only when two merchants offered him rice cakes and honey. Brahmâ came down from the heavens, imploring him to teach; certain beings “with little dust in their eyes” would understand his profound teachings on nibbâna. The Buddha wanted to enlighten his former teachers, but clairvoyantly saw they had died. His divine eye then revealed the whereabouts of his five former companions: the Deer Park at Sârnâth (125 miles away, near Vârânasî). En route to meet them, he sang a lovely hymn to Upaka, who later became a disciple. At Sârnâth, he met the five ascetics; tradition says he gave a first sermon on the Four Noble Truths (ariya-saccâni): dukkha/misery exists (all phenomena are inherently dissatisfactory), a cause for misery exists (selfish craving, tanhâ), an end to misery can come by removing this cause, and freedom from all misery comes via the Noble Eightfold path (right view, thought, speech, action, livelihood, effort, mindfulness, concentration)—this latter synopsized as the “triple training” in virtue/sîla, concentration/samâdhi and wisdom/paññâ. The ascetics, Kondañña, et al., allegedly gained full awakening over the next few days hearing the Buddha preach the truth of not-self (anattâ). They became the first members of his sangha-community. The Buddha soon converted a rich merchant. His son Yasa and fifty-four friends joined the Buddha’s Sangha of almsmen (bhikkhus/bhikshus) and were sent out as enlightened missionaries. Wandering south back to Uruvelâ, he won over popular brâhman ascetic Kassapa; he, his two brothers, and their thousand disciples abandoned the Vedic fire rite to follow him as almsmen and soon, like the others, realized nibbâna. After three months here, Sakyamuni went east for two months at Râjagaha in Magadha. King Bimbisâra and a few thousand locals joined the order as lay followers, upâsakas, or as ordained bhikkhus. They took refuge in the Three Jewels (tiratana/trîratna): Buddha (the Awake Teacher and Principle of awakening), Dhamma (Dharma, the Way or Doctrine) and Sangha, and adopted the ethical precepts geared to the moral perfection and clear conscience conducive to nibbâna. Outside Râjagaha, the King built for the Sangha a big monastery, the Bamboo Grove. Here, six years later, Queen Khema heard the Blessed One and joined the order; she was later regarded as foremost among women disciples in wisdom. Sâriputta and Moggallâna, two young brâhman ascetics, came to the Buddha, becoming his greatest male adepts of wisdom and paranormal psi power (iddhi), respectively. 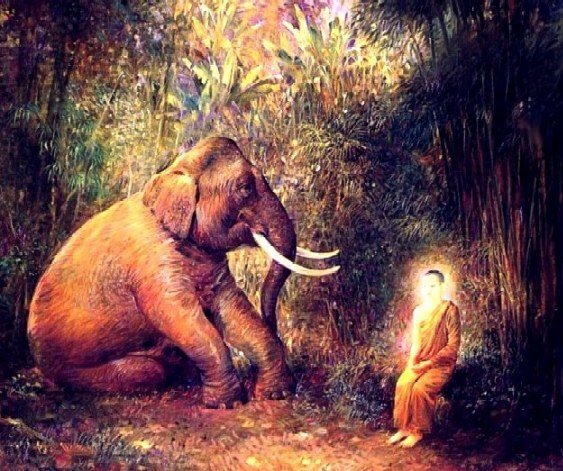 Young brâhman Pippali was awakened on the spot when the Buddha saw him amidst a throng and gave him pithy teachings and an intense smiling gaze. He became the venerable Mahâ-Kassapa, presiding over the first Buddhist Council after the Buddha’s passing; he himself lived to age 120. The Buddha, along with some two thousand followers, slowly sojourned north to his native land, where his miracles won over the proud Sakyan nobles. He taught his father Suddhodana and ordained his own seven-year-old son Râhula as the order’s first novice. Other Sakyan kin, nobles and citizens joined the order, including half-brother Nanda and cousins Ânanda, Bhaddiya (the Sakyans’ active ruler) and Devadatta, who became a revered adept but decades later led a schismatic group adhering to an austere forest lifestyle over settled monasticism (a later smear campaign depicted him as evil-doer thrice trying to kill the Buddha). Meanwhile, the Buddha is said to have permitted his almsmen to have shelter if they wished, not just live under trees or in caves; so rich patrons like Anâthapindika built monastic vihâras and common folk erected myriad thatched huts to shelter those who had sacrificed all comforts to go forth into homelessness and realize the goal. Five years after his enlightenment, the Buddha again visited Kapilavatthu to help his dying father attain nibbâna. Stepmother Pajâpatî Gotamî and a large band of Sakyan noblewomen bravely left their sheltered lives, cut their hair, and, as devout almswomen, walked the rough roads to catch up with the Buddha near Vesâlî. Initially reluctant (no doubt concerned for their safety and patronage), he was persuaded by Ânanda to let them be formally ordained bhikkhunîs/bhikshunîs—a major development in Indian society. He appointed Pajâpatî head of the female renunciates. His wife Yasodharâ, said to have lived for years as an ascetic within the palace, joined the almswomen. These two ladies both allegedly realized nibbâna. Of the multitude who joined the Sangha during the Buddha’s life, over one thousand apparently attained “that unexcelled culmination of the holy life, having realized it here and now by their own super-knowledge… knowing: ‘Birth is destroyed, the holy life has been lived, what had to be done has been done, no more becoming in any state.’” They had become arahants, perfect in wisdom and morality, their freedom the same as the Buddha’s. Yet they still deferred to him as Tathâgata, the term he used for himself, meaning one “thus come” and “thus gone.” He is “the one who comes into our midst bearing the message of deathlessness to which he has gone by his own practice of the path.… He is not merely a wise sage or a benevolent moralist, but the latest in the line of Fully Enlightened Ones, each of whom arises singly in an age of spiritual darkness… and establishes a Dispensation (sâsana) through which the path to deliverance again becomes accessible to the world.” The Buddha-sâsana was now flourishing en masse. The Blessed One roamed for 45 years through the mid-Gangâ region, from Kuru (Delhi) to Anga (Bengal), walking the plains’ dusty roads and the Himâlayan foothills’ rocky paths. There he was, of handsome visage, garbed in his simple patched-robe, staying under a tree in a forest, in a small hut or great assembly hall, on a verandah, in a deer park or mango grove. Utterly poised, pure in speech and act, avoiding frivolity and entertainment, radiating freedom’s peace… He preached, advised and ministered to all who came. The Bhagavâ meditated in solitude each morning, “abiding in voidness” or scanning the minds of beings, viewing with clairvoyant eye anyone ready for edifying teachings or having difficulties. He meditated, not just sitting down, but also mindfully pacing back and forth. Daily he ate in his earthen bowl one pre-noon meal, received on alms-round or at a private home. He slept only a few hours nightly, adding a short mid-day rest in the hot season. The monsoon rainy season settled him with other sangha members for three months’ residency, usually at a large vihâra built by a patron, chiefly Anâthapindika’s park in Jeta’s Grove and Eastern Park given by patroness Visâkhâ, both near Sâvatthî in Kosala, or Bimbisâra’s Bamboo Grove near Râjagaha. Large throngs of almsmen who accompanied the Buddha received sublime training under his guidance. Often he went alone or with an attendant (usually Ânanda) to counsel individuals. His sterling reputation drew up to hundreds of visitors at a time—mainly townspeople, but also villagers: men, women, shrâmana ascetics (clothed, naked), sectarian teachers and disciples, kshatriya-caste kings and ministers, rich merchants, gentleman farmers, outcastes, robbers; and many brâhmans and their students, who came to see this shrâmana leader far more than any other. The Buddha persuaded these brâhmans to stop killing animals and exploiting slave labor at their extravagant yajñâ rites, and to realize the best sacrifice is giving alms to worthy ascetics and, even better, becoming a renunciate oneself. He insisted that a brâhman’s status solely derives from wisdom and morality, naught else. Truly, the authentic brâhman is the perfect arahant. As for the shrâmanas, the Buddha warned that their self-mortifications tend to lead to pride and showing off, not freedom. The road could be rough, especially in the early years. Certain other shrâmanas and brâhmans, smitten with envy and jealousy, seriously slandered the Buddha and his Sangha, trying to tarnish them and gain favor for themselves in the eyes of society. But the serene equanimity of the Holy One and his companions convinced the populace of their innocent purity. A scientist of consciousness, the Buddha saw that trillions of material and mental events occur in each second of phenomenal existence; he saw the open gaps between these moments of phenomenal manifestation, and he knew That which transcends them —the Unborn, Uncompounded Nibbâna. A doctor for suffering beings, he knew which spiritual practices and meditation topics to apply to a given individual’s temperament and current state. A century before Socrates, the Buddha deployed with gentle wit the “Socratic method,” using series of deft questions to lead his visitors along a path of enquiry and wisdom so they could experience truth for themselves. Five hundred years before Jesus, he generated cogent parables and earthy metaphors to illumine his listeners’ hearts and minds. And he always deflected those endless speculative questions that “tend not toward edification”—akin, he said, to a man shot with an arrow, rather than quickly extracting it, instead asking about the maker of the arrow, the materials used to make it, and other irrelevancies. The pragmatic Siddhattha wanted people free, not head-tripping with the intellect—so he repeatedly highlighted basic themes of morality, detachment and sagely wisdom. This Dhamma was the Tathâgata’s great raft to bring people safely to the “other shore” of nibbâna, beyond the terrible ocean of samsâra created by people’s chronic ignorance, clinging, craving and egoic self-indulgence. One of his more important models is the Ten Fetters (samyojanâni): 1) holding onto the concept of “self” or enduring personality, 2) doubting the Dhamma and its capacity to awaken people, 3) clinging to magical rites or austerities as effective, 4) attachment, 5) aversion, 6) greed for material existence, 7) greed for life in the formless heavens, 8) conceit, 9) restlessness, 10) primordial ignorance (avijjâ). In his corresponding model of the Four Higher Individuals (ariya-puggalâ), the Buddha declared that anyone free of fetters 1-3 would require, at most, only seven more lives on earth before realizing nibbâna (this one is a sotâpanna, “stream enterer”). Anyone diminishing fetters 4-5 requires just one more life here (a sakadâgâmî, once-returner). Anyone fully eradicating 4-5 is a non-returner (anâgâmî) who will realize nibbâna in a “pure heaven” rebirth. One who vanquishes fetters 6-10 is a perfected Arahant, of the same liberated consciousness as a Buddha. The Pâli Canon often has the Buddha and disciples assess each aggregate: “This is not mine; this I am not; this is not my self” (n’etam mama; n’eso ’ham’asmi’; na me’so attâ)—akin to the disidentifying formula neti, neti (“not this, not this”) of the Brihadarânyaka Upanishad. In his crucial schema outlining true wisdom, the Buddha affirms that all apparent persons, things or events are characterized by the three marks of existence (tilakkhana): 1) incessant change (anicca/ anitya), arising and passing away; hence 2) insubstantiality, no solid, lasting selfhood (anattâ/anâtma); therefore, 3) all arising appearances are dissatisfactory (dukkha/duhkha), incapable of providing permanent welfare or enduring fulfillment, only stress, ill, misery, suffering. We pause to note that the idea of anattâ, “no self,” has been a big stumbling block for many Buddhists and non-Buddhists. Recall that the Buddha firmly rejected nihilism—his anattâ teaching was an antidote for those who identify with a sense of personal, separate self (attâ; Skt. : Âtman). Once he was pointedly asked, “Is there a self?” He sat silent. “Then is there no self?” He also remained silent. Thus, it has been wisely suggested that his anattâ teaching isn’t metaphysics, but rather a “not self” strategy for disidentifying. In any case, viewing phenomena through these clarifying lenses of the five aggregates and three marks shatters any “normal” sense of a real world of multiplicity, any subject-object dualism. Flux foaming out of and made of emptiness is the true nature of the conventional self and world. This is what is insightfully known via wisdom (paññâ) and “clear seeing” (vipassanâ). This realization emerges in the Buddha’s most recommended meditation: mindfulness/sati. Whereas absorptive jhâna meditations tend toward ever subtler states of concentration culminating in nirodha, cessation of all attention —mindfulness meditation examines the moment NOW with clear comprehension of the transiency, insubstantiality, undesirability and “suchness” of the five personality “heaps” or khandhas. One begins with the body: its breathing (inbreaths, outbreaths, long, short), its sensations from scalp to toes, its different postures (sitting, standing, walking, lying), its different activities (talking, eating, drinking, eliminating, bending, carrying, etc., “clearly aware of what one is doing,” sampajâna-kârî hoti), its 32 parts (20 solid, 12 liquid), its basic elements (hard, fluid, fiery and airy), and its postmortem states of decomposition. “Thus one abides detached, grasping at nothing in the world… abiding in contemplation of the body.” One also mindfully comprehends sensations-feelings (pleasant, unpleasant, neutral), knowing them as such, abiding detached, non-grasping. One mindfully knows thinking (passionate, dispassionate, aversive, non-aversive, confused, clear, concentrated, diffused, low, lofty). One is aware, too, of certain mind-objects: the Four Noble Truths and Seven Factors of Enlightenment (satta bojjhangâ), the latter a way of keeping spiritual balance through 1) mindfulness, 2) investigating truth (dhamma-vicâya), 3) energy (viriya), 4) rapture (pîti), 5) serenity (passaddhi), 6) concentration (samâdhi) and 7) equanimity (upekkhâ). In his 80th year, the Buddha knowingly ate spoiled food in a meal—he’d asked the good patron Cunda that the monks be fed other fare. Shortly after, traveling east with Ânanda, he fell gravely ill and lay down for a time. He had made several predictions in the previous months that he would not be long on earth. Making his way to a grove of sâl trees near Kusinârâ (in Uttar Pradesh), he asked the large gathering of disciples if they had any doubts or questions about the Dhamma, but all stayed silent. Then the Blessed One gave famous last instructions: Vayadhammâ sankhârâ. Appamâdena sampâdetha. “Transient are all conditioned things. Accomplish earnestly! (Strive on tirelessly! )” (Mahâparinibbâna Sutta, Dîgha Nikâya 16.vi.7). After inwardly surveying all realms, high and low, and the eight jhâna absorptions, he entered the fourth jhâna and consciously breathed his last. He had been born in a forest, practiced and awakened in forests, and now died in a forest, the quietude broken by the weeping of more emotional disciples. Arriving with five hundred monks a week later, the Ven. Mahâ-Kassapa succeeded in lighting his master’s funeral pyre in accord with the devas’ wish. The cremation wondrously left only bones, no ash. Memorial stñpas were promptly erected in ten places to house the relics, urn and pyre-embers. The Buddha, like all ancient sages of India, taught in a context of oral transmission. But he spoke local Middle Indic vernacular languages, not Sanskrit. He emphasized easily memorized schemas, hence the many lists of numbered topics, which may be rather tedious to read but convey a sonorous, stately cadence when chanted by Theravâda Buddhist communities. He often dropped the formulaic style to issue penetrating utterances that deeply awakened his listeners. He had a poetic sensibility, yet eschewed the flowery, effete style of the poets. His teachings (and teachings from enlightened disciples) were passed down in numerous volumes, often including parallel verses identical or nearly identical to each other. The Pâli Canon, the Tipitaka “triple basket” collection, divides into the Sutta discourses, the Vinaya works on monastic discipline, and the Abhidhamma “advanced doctrine” works (of a more technical, psychological nature, composed by his more scholastic followers). Most readers are drawn to the Sutta-pitaka’s five Nikâya collections: Majjhima Nikâya, with its 152 “mid-length” discourses; Dîgha Nikâya’s 34 “long” discourses; Samyutta Nikâya’s nearly 2,900 short discourses grouped in 56 topics; Anguttara Nikâya’s 2,300+ discourses grouped in ones, twos, threes, etc. ; and Khuddaka Nikâya’s “little text” collection of 15 motley works, including the important Sutta Nipâta (containing the Buddha’s earliest recorded teachings), the famed kavya (belles lettres) work Dhammapada, the Udâna, the Itivuttaka, the Theragâthâ and Therîgâthâ “songs of enlightened elders” (male, female), and the Jâtaka folktales of former lives. The Buddha taught the sage Bahiya, who had approached him while on almsrounds and thrice asked for Dhamma teachings: “Bahiya, train yourself thus: ‘In the seen will be merely what is seen; in the heard will be merely what is heard; in the sensed will be merely what is sensed; in the cognized will be merely what is cognized [i.e., no extra, complicating ego-thinking].’ In this way you should train yourself, Bahiya. When for you in the seen is merely what is seen.... in the cognized is merely what is cognized, then, Bahiya, you will not be ‘with that.’ When you are not ‘with that,’ then, you will not be ‘in that.’ When you are not ‘in that,’ then, Bahiya, you will be neither here nor beyond nor in between the two. Just this is the end of suffering (Nibbana).” Bahiya was enlightened by these words. 1) The Theravâda or “Way of the Elders” tradition is practiced in south Asia—Thailand, Burma, Cambodia and Sri Lanka. This is the oldest, simplest tradition, tracing itself right back to the words of the Buddha as recorded in the Tipitika (Triple Basket) Pali-language scriptural Canon of sutta-texts. It mainly involves the ongoing meditation practice known as vipassanâ, or insightful “clear-seeing”—usually paying attention to breath sensations or other body sensations, and noticing how all arising experience is incessantly changing, not solid. Of course, modern physics has revealed the same thing about the world—which is realized to be mere vibrations of mysterious energy fields. The end result of vipassanâ meditation is a great experience of detachment from the body-mind (i.e., sensations, thoughts, and emotions) and the realization that the personal self, the “me,” is a fleeting dream. An authentic realization of this profound insight is called nibbâna, better known in the later Buddhist Sanskrit language as nirvâna. This term literally means the “blowing out” of the fire of egotism. What remains? The early Buddhists and the Theravâda Buddhism that grew out of this earliest development don't like to speak about Spirit or God (unlike Hindus, Jews, Christians or Muslims), because this could and often does degenerate into mere conceptual knowledge. Instead, Buddhists say that nirvâna is the magnificent spiritual realization of peace, bliss, freedom, and the Unborn, Uncompounded, Unmade Reality, the “unconditioned Condition.” Vipassanâ (vipashyanâ in Sanskrit) is a very powerful form of meditation. You can think of it as a radically wise form of sensory awareness: everything you hear, touch, feel, see, taste, smell, or think is 1) impermanent; 2) insubstantial; 3) not worth clinging to (these are the “3 marks of existence” that every Buddhist realizes). Vipassanâ meditation is an excellent method for promoting clarity, groundedness, no-nonsense sanity—and sanctity—and utter dis-identification from the narrow, egocentric sense of self and all the worldly and psychic objects to which the ego sense “self”-ishly clings. Traditional accounts say that Zen goes all the way back to an Indian Mahâyâna Buddhist sage named Bodhidharma (died circa 530s CE) who brought a highly intuitive form of Dhyâna (Meditation) Buddhism to China, where it became known to a circle of practitioners as Chan. More realistically, as scholars have shown, a settled form of Chan monasticism did not begin until the latter 600s CE and then spread more widely under the considerable influence of the illustrious sage Mazu (709-88) and his followers. In the late 12th century and especially the 13th century, after flourishing in China along five major lineages, this Chan Buddhism came to Japan, where it is found in two main lineages or sects: Rinzai Zen and Sōtō Zen. Rinzai Zen makes special use of koans (Chinese: gong'ans), those paradoxical, irrational-sounding riddles or enigmatic questions, such as “Where were you 1000 years ago?” or “What is the sound of one hand (clapping)?” or “What is Nothing (mu; Chinese: wu)?” For Westerners, most Rinzai Zen teachers have more helpfully used simple koans like “What Am I?” or “Who is aware of the breathing?” Zen is a direct pointing back at the utter no-thingness of Spirit, our Absolute Identity or True Nature upstream from the mind, this (near) side of the mind. Rinzai Zen teachers try to boggle the mind so as to propel a person right back HERE to their True Nature as pure Awareness, utterly simple Is-ness, the Groundless Ground of Being which is completely formless yet, paradoxically, the very source and substance of all forms of experience. This brings Zen "full circle" to a realization that Reality is both empty and full, Reality is entirely beyond the worlds yet manifesting as all worlds and each being and situation. The Sōtō Zen tradition does not make much use of kōans, though the first Japanese Sōtō Patriarch, Dōgen Zenji (1200-53), had made a special collection of some Chinese 300 kōans and often discussed these and other kōans with students. Sōtō usually invites one to simply demonstrate one's primordial Buddha-nature (Awareness) by serenely "just sitting" (shikantaza), walking (kinhin), eating, working, etc. Both Rinzai and Sōtō Zen masters appreciate the need for authentically living the supreme, irreversible, perfect enlightenment, anuttara-samyak-sambodhi. But unlike the Rinzai Zen tradition, in Sōtō there is no fervent striving for a great breakthrough "enlightenment experience" (kensho or, at a deeper level, satori). Instead, there is the assumption that when we act simply, naturally, and with clear awareness, we plainly demonstrate our original enlightened nature in “extraordinarily ordinary” fashion. The Sōtō Zen tradition thus involves a calmer, less urgent attitude, though clearly there is a sense of deepening in one's expression of the Truth. Rinzai Zen has a greater sense of drama and theatrics to it, especially in the ferocious mondo exchanges between master and disciple over the demonstrating of "answers" to the kōans. Note that some Zen masters in America utilize both Rinzai and Sōtō Zen approaches. Note too that both of these Japanese Zen traditions were influenced by the martial samurai tradition, so a certain formality characterizes many (most) Zen centers in America, whereas the Chinese Ch’an Buddhist centers, Korean Son Buddhist centers, and the vipassanâ tradition of the Theravâdins are, generally speaking, usually rather less formal. But the sense of formality can vary depending on the particular Zen community and teacher. 3) The third form of Buddhism is Tantra, which arose along with Hindu Tantra in south and then north India somewhere around the 7th century CE. Tantra involves chanting mantras (sacred syllables), and doing elaborate ceremonies and visualizations. Whereas there is an ancient Japanese tantric school, Shingon, founded by Kûkai "Kōbō Daishi" (774-835), the main tantric tradition of Buddhism known to the West is the one centered in Tibet, known as Vajrayâna. There are 4 main lineages of Vajrayâna in Tibet—the Nyingma, Kagyü, Gelug, Sakya (H.H. the Dalai Lama, incidentally, heads to the Gelug sect). They all involve very complicated forms of visualization and meditation practice, culminating in the great ease of the naturally enlightened state, called Dzogchen in the Nyingma and Mahâmûdra among the Kagyü lamas or gurus. Vajrayâna is a very “colorful” Buddhist tradition, not only ornamentally rich with vibrant colors (red, blue, green, orange and white--in contrast to the Japanese Zen tradition, which involves muted colors and a lot of black and gray). Vajrayâna features not just majestically serene Buddhas and bodhisattvas, but also very “wild” forms of the deities, some of whom are depicted as quite fearsome-looking. (Whenever you see such hideous images, know that they are actually intended as symbols of the Divine destruction of our selfish ego tendencies.) Most Tibetan Vajrayâna Buddhist masters will give instruction in basic Buddhist vipassanâ / vipashyanâ meditation, and then, depending on how deep you want to go into the tradition, they will initiate you into the very complicated tantric practices of mantra recitations, mandala visualizations of Buddhas and bodhisattvas (enlightening beings, akin to Buddhist angels of wisdom and compassion). 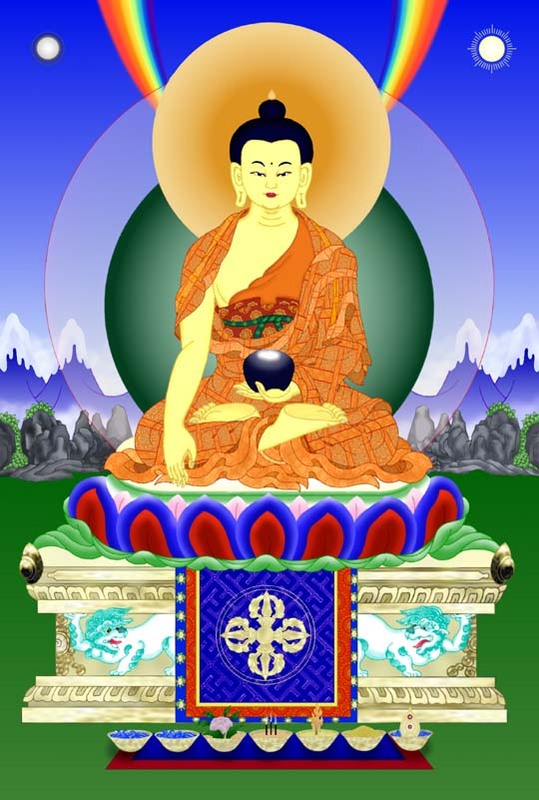 It is important to realize that all Buddhist traditions aim at the complete transformation of the human being: from self-centered ignorance, attachments and aversions (the three poisons) into unshakably steady peace, spiritual freedom from all that binds, unconditional bliss, profound wisdom, loving-kindness and all-embracing compassion.